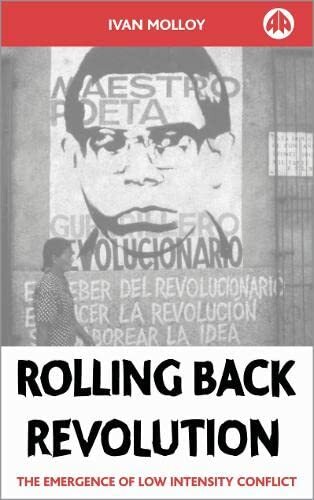 Rolling Back Revolution: The Emergence Of Low Intensity Conflict: 9780745317076 Hardcover - LIMEROCK BOOKS INC.
Ivan Molloy analyses the de facto foreign policy strategy of low intensity conflict (LIC) as propagated by the United States. He recounts how LIC emerged during the Reagan Administration as a way of counteracting the legacy left by the Vietnam War, which constrained America from getting involved in direct military intervention. Part covert, part overt, LIC was developed as a low-cost and low-risk method of dealing with revolutionary movements and post-revolutionary governments (usually Marxist) considered threatening to national interests. As such, this secretive strategy was an integral component of the Iran-Contra affair, and at the heart of the Reagan Doctrine.Molloy argues that LIC was a means of civilianising and privatising America&#x2019;s foreign policy. He reveals that LIC was always more of a political, rather than military, tool. The United States used LIC selectively in the 1980s to combat guerrilla movements and undermine targeted regimes to achieve its foreign policy objectives. The author uses Nicaragua and the Philippines as major case studies to analyse the profile of this multi-dimensional strategy as it emerged in the 1980s. He also demonstrates &#x2013;&nbsp;using such examples as Cuba, Yugoslavia and East Timor &#x2013;&nbsp;that this complex strategy is still evident today and even pursued by other states. Ivan Molloy is Head of Politics and International Studies at the University of the Sunshine Coast in Australia.